This year celebrates Polydomes 25th year in business. And it is an exciting year with many new changes happening in the company from product ranges, to new display areas as well as many other ideas that we hope to work on over coming 12 months. But for now it’s time to take a moment to relax and enjoy our birthday. 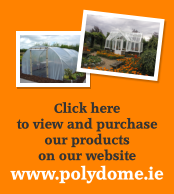 And in doing so, we will be running many special offers on our website over the coming months, as well as a competition for a free Polytunnel worth a €1,000. The competition is now open and will run until 12 noon on the 25th of March 2011. You can enter using our website. All you need to do is enter your details and answer one simple question. So don’t waste any time, log on and you could be in with a chance to win a free Polytunnel.